Link Previews for Web Sites Released by Softel vdm, Inc.
Offering previews for links on web pages may not be a new idea, but Softel vdm, Inc. has turned it into a super-simple web service that can add Link Previews to a web site in minutes. Softel vdm, Inc. has made a new web service available that adds Link Previews to a web site. As a user's mouse hovers over the link on a web page, a preview of the page is shown, or on mobile devices, users can click on the small icon next to the link that is automatically inserted right next to any link that offers a Link Preview. Setting up Link Previews for the average web site takes just minutes and the site is then immediately ready to show off Link Previews. Once set up, LinksWithPics.com takes care of delivering the Link Previews and also continually creates updated previews, at regular intervals, so Link Previews are never out of date for a site. Softel vdm, Inc. is offering a free, fully functional 14-day demo of this new service. Add Link Previews to any web site in minutes risk-free. The LinksWithPics service is available starting at just $49.99, which includes 6 months of Link Previews for one web site. 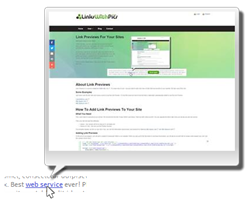 The easy to follow steps to start using it on your site are available at http://LinksWithPics.com/. Since 1994, Softel vdm, Inc. has been developing and publishing programmer productivity tools and web services (such as LinksWithPics), serving the Windows and Web community world-wide for over twenty years. For more information about the company and its full line of services visit http://LinksWithPics.com and http://softelvdm.com.